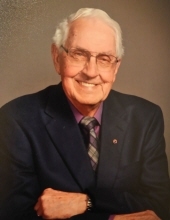 Robert Floyd Copeland, 84, passed away on November 6, 2018. He was born in Clay County, KS to Effie (McMahan) Copeland and Beattie Copeland on August 25, 1934. Robert married his high school sweetheart, Barbara (Chapman) Copeland on May 21, 1955. Together they raised 4 children. Robert worked for Graybar for 34 years; always setting an example of hard work for his family and those around him. He was preceded in death by his parents, Effie and Beattie; brothers, Joe, Don, and Del Copeland; and sisters, Edna Hatfield, Mary Goodin, and Viola Oberhelman. He is survived by his wife, Barbara; children, Randy (Lynda), Ron (Gina), Rod (Jean), and Rebecca; 10 grandchildren, 17 great grandchildren, 3 sister-in-laws, many nieces and nephews, and his church family. Services will be held on December 1, at 10:00am, Palm West Community Church, 13845 West Stardust Blvd, Sun City West, AZ, 85375. Memorial funds are to be sent to Palm West Community Church to be divided between the Angel Fund and the Valley View Food Bank. What matters most of all was the dash ( - ) between those years. Now only those who love him know what that little line is worth. What matters most was how he lived and loved . . . how he spent his dash. He worked 34 years with Graybar (CO to IA, back to CO) and retired at 58. After settling in their nest, they sought a wonderful church home. He always slowed down enough to consider what's true and real . . . .
What matters is Robert's dash has left us with a smile!